Theme Day this month is cobblestones. There aren't many cobblestoned streets left in Boston. 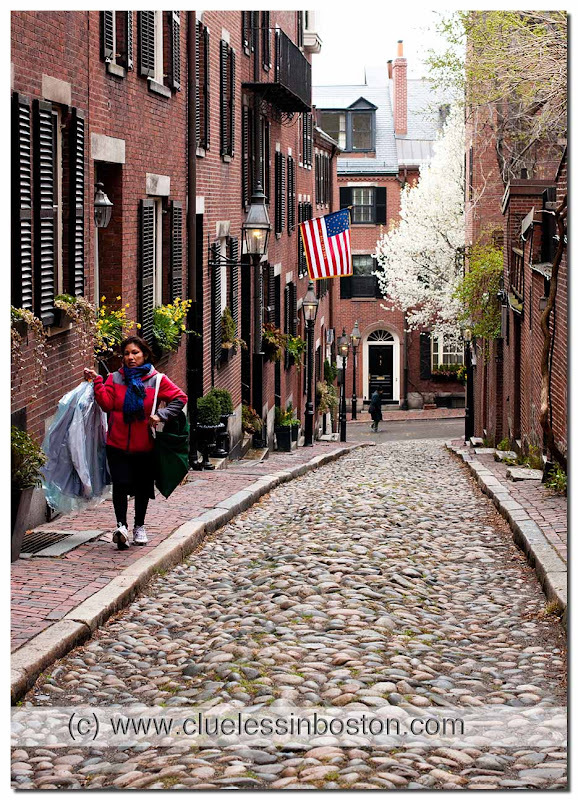 Acorn Street pictured here is one of the most photographed and picturesque streets in Boston's Beacon Hill. This is beautiful. The cobbles look as if they were once pebbles, as per in Menton in places. No surprise this is a much photographed street in Boston. Although not cobblestones, the picture is beautiful. This street scenery is adorable, I love the cobblestones in this picture! I'd gladly spend some time photographing this street given the chance! Imagine driving down that in a horse drawn carriage! A very bumpy ride indeed! Fortunate indeed that there is a smoother walkway for pedestrians...can't imagine trying to navigate those cobblestone. It looks like a stream, doesn't it? Bet that is wicked slick in the rain! Totally beautiful! I thought you would have tons of choices for cobblestone streets - so sad to hear there aren't many left. Brilliant. What a gorgeous street! I really need to visit Boston. Nice street and great pic. Good contrast between the cobbles on the road and the setts on the pavement. This is great...I am seriously considering Boston for my next trip! A perfect choice for the cobblestone theme, Clueless. How did I miss this, gosh that would rattle your teeth to drive or cycle on! What a fabulous image for the theme. This is my absolute fave. When I think of Boston, this is what I see. LOVE IT! Wow, that is soooo pretty!